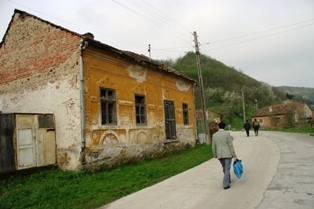 Yesterday Saturday April 22nd, I went with Mari, my Romanian brother-in-law to visit his village, called Tisa (pronounced Teeza), the village is located about a 1 hour train journey west of the town of Deva where I live. 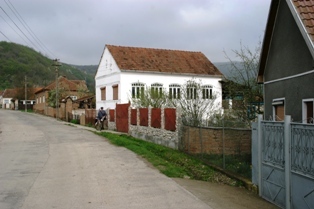 Its located near the bank of the river Muresh, a quite, sleepy place, of about 150 houses and maybe a population of 300, mainly old people. Some of the houses carry dates from the 1900s over the gables. 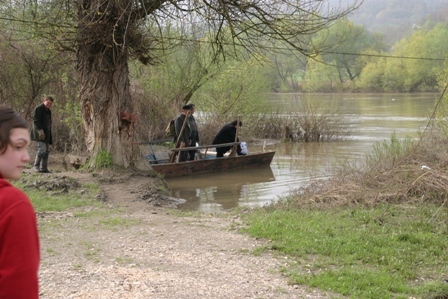 After getting of the train, we had to climb into a boat to make the crossing to the village on the far-side of the river, which was an interesting experience as the boat used the flow of the river to power its self across, attached by a chain to a pulley suspended over a cable slung over the river, needless to say not a life jacket to be seen for those of faint-heart and limited swimming abilities , but seeing as the river was in full flood maybe the life jacket would have been of little help, after getting across the river with no mishap, we walked the 15 minutes to the village. 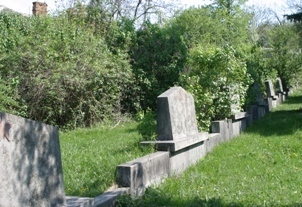 I spotted some headstones of men in uniform and managed to take some snapshots, while talking to a local, he told me there was a war memorial to the "Heros" from the locality, with their names, etc., but being made of wood, with time it simply fell into dis-repair and now no trace of it remains. I will attach the photos of the headstones, some have a picture of the soldier in uniform and some are in civil attire. Two of what I took to be soldiers might be Railway men Next time down there I will ask around. 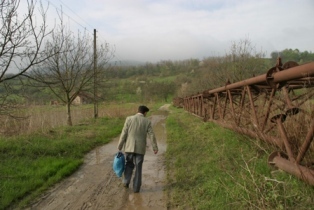 There is also supposed to be a doctor in the village who is a WW2 veteran but in ill-health, but if its convienient I will try to get a visit to him. Crossing the river and heading for the village, the steel stuff is a bridge thats lying there for the last 5 years as there is no money to erect it on the columns placed in the river banks . Passing through the village. Some nice houses, some not so nice, money is scarce. 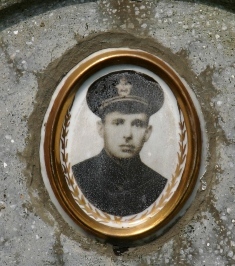 Its to: HERO IOSIF MANGA, Born 1911 - Died 1944. R.I.P. 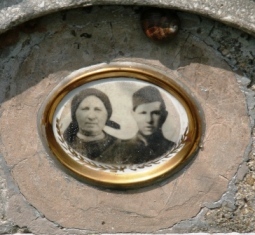 The woman in the picture could be his wife , the picture is composed from, two different photographs, strangely the family have not inscribed her date of death yet. ANA MANGA, Born 1916 - Died ? R.I.P. 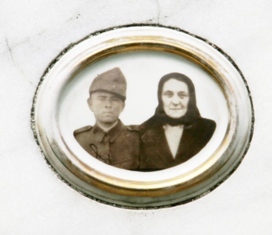 Its to: HERO ALEXANDRU MARIS, Born 13. 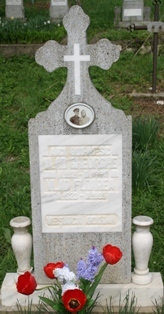 MAY 1911 - Died ? ? 19??. R.I.P. Possibly a senior Non-Commissioned Officer or Officer judging by all the braid on the shoulder. And it has just occured to me that the photo might have been printed from the reverse of the negative, I belive the braid / lanyard hung from the LEFT shoulder!! Its to: HERO IOSIF VLAD, Born 22. 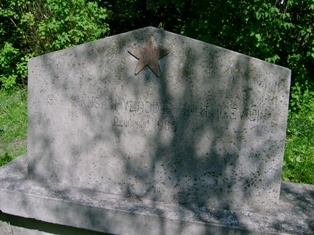 April 1922 - Died 29. September 1945. R.I.P. 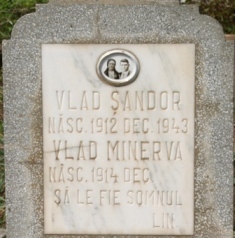 HERO SANDOR VLAD, Born 1912 - Died Dec 1943. 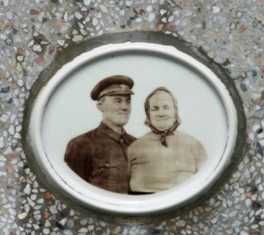 Its to: HERO PETRU LUNCAN, Born 1920 - Died 1944. R.I.P. 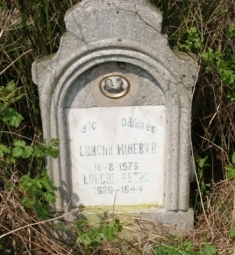 MINERVA LUNCAN, Born 1898 - 1973 (Mother? Sister?) R.I.P. 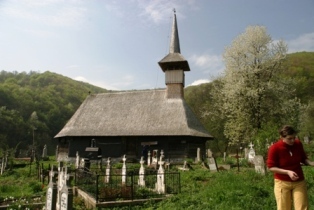 The little Church is constructed entirely of wood, and according to the local man I spoke with, was originaly transported down the river on a barge and constructed in its present location. As its getting late here I will post more tomorrow. Is there a lot of snow there in the winter? I have always wondered about the very odd style of churches. did you take the long hard way in, and is there a highway on the other side? Well it is possible to drive fron Deva into the village without having to go over the river, the Road going from Deva to Lugos and Timosoara, but the train follows the river and the road beside it and rail way goes Deva to Arad, as my brother-in-law has no car, as well as being un-employed (since he lost his job at the local Romanian Arms factory ) it was cheaper to hop on the train and then sail over the river, the walk from the river to the village is about 25 mins, great excercise for an old soldier . The churches style can also reflect the influence whether Catholic, Orthadox, Saxon, Hungarian etc..etc and also depending on how much money could be raised from the locals to build it. 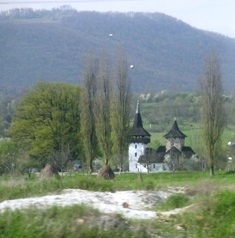 The other church shown in this post is 600 years old and located outside Deva on the Arad road. 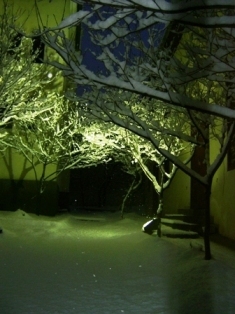 With regards snow Romania normly gets a lot, but since I came to live here in 2002 the winter has been kind to us in the south Transylvania region, but January 2005 we did register -36? in Deva but had little snow, but over in the North East region up and into Moldova they had drifts in some place s of 3 meters and the army had to use tanks with snow-ploughs to clear the roads. 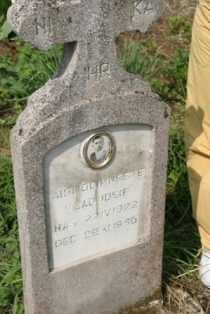 Its to: GHEORGIE VLAD, Born 1921 - Died 1996. R.I.P. FLOAREA VLAD, Born 1923 - 1995 (Wife?) R.I.P. 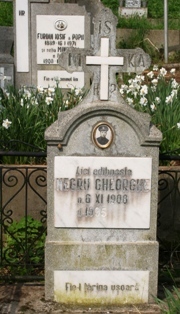 Its to: GHEORGHE NEGRU*, Born 6 December 1908 - Died 1995. R.I.P. Hard to make out the insignia on the cap looks like a crown over a winged wheel, if so he to is a Railway man, I will make more enquires the next time I visit. * In english his name would be George Black. Thanks so much for the photos, it makes me need a vacation more then ever. 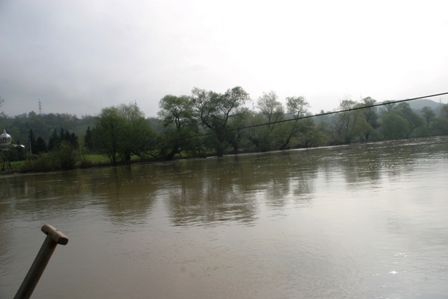 Romania is a very beautiful country, and very cheap for a holiday, some places offer very basic services but with each year the service improves. and the people are very hospitable, Romania has got some bad press with regards the Gypsey's who go to Italy, France, G.B. etc. etc and get caught stealing, they are very anti-social even here in Romania, they have no love of work, refuse to intigrate into society (under Ceauchescu the Dictator they were made send the kids to school, since the Revolution, they dont bother to do that) and begging & stealing is their full time business. I am not being a racist here, to understand their mentality, you have to see the way the Clan leaders (who never had a job in their lives) live in 5 story "kitch" palaces, big cars and the women have their gold necklaces, ring and jewelry, big cars etc., etc. all this is from the smaller minions in the clan who go out everyday begging and stealing on the streets. Dan If you are interested P.M me your email address I will send you some more scenic shots full size..
KOKUSKIN. 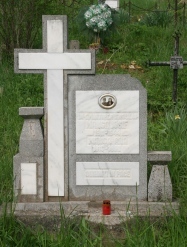 VLADIMIR ANATOLIEVICI, R.I.P Exhumed in 1968, (presumably for return to Russia). 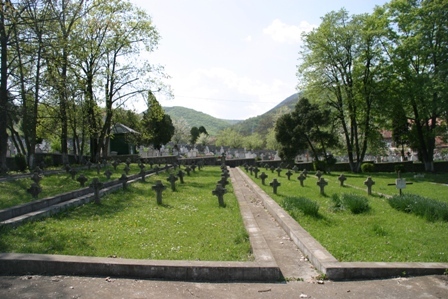 the other shot shows the graves of Romanians killed in late WW2 whether with the Germans against the Russians, or with the Russians against the Germans is not yet known by me. I hope to photo and document all the names and ranks, over the summer, there as the crosses are made from concrete and eroded by the weather, These crosses don't carry any pictures though. Thank you id really like that. And no fear about the bad press, we have gypsys here in Canada to. you cant let a few rotton apples spoil a bushel, or something like that. Hi Kev, a poignant thread. Some great photos and thanks for bringing this record of history to the Forum. 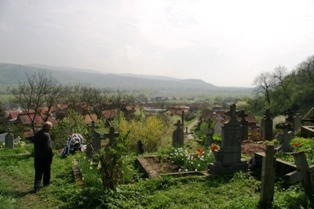 well even though it seems the Deva graveyard is somewhat neglected, on the Romanian National Day 1st of December, a local Military unit marches a Platoon up the road to the cemetery and lays wreaths at the War memorial, also wreaths are laid from the Police and Jandameria and the Mayor. 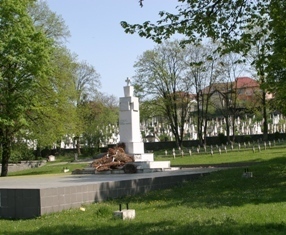 The white marble monument is shown in one picture on this post, around it are the wreaths from December, to the upper rear all the gravestones in white are in part of the civilian section of the graveyard. 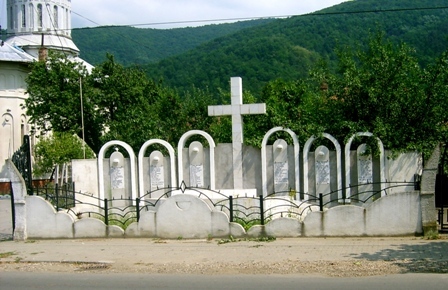 The small crosses in front of the black wall are all WW2 era for mainly Romanian soldiers. SOLD(AT) RUS. LESGENCO ALEX 23 VIII 1944. R.I.P. SOLD(AT) FRATILIA CONST. REG 98. INF 1944. 16. VI. 1944 R.I.P. why the date 1944 is repeated twice I have to find out. 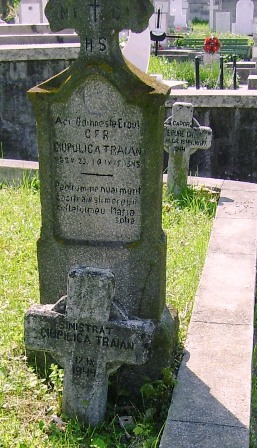 SINISTRAT (CIVILIAN) CIUPILIGA TRAIAN. R.I.P. Erected to his memory by his wife Maria. He was probably killed in one of the many bombing raids carried out by the US AIRFORCE against the main Railway Junction in Simeria about 10kms East from Deva. They US flew missions out of North Africa, and later out of Italy against targets in Romania. 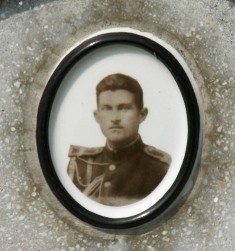 UNKNOWN SOLDIER / EROU NECUNOSCUT R.I.P. the literal translation is Unknown Hero. 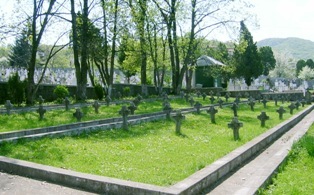 Another shot of the right-handside of the Military Grave-yard in DEVA, in this section there are well over 50 graves and about the same on the left-hand side. Another view of the Monument to the "HERO'S" they usually leave the wreaths till they wither away, some basic maintenance will be required to the marble of the monument and the surrounding floor tiles as its showing signs of age. 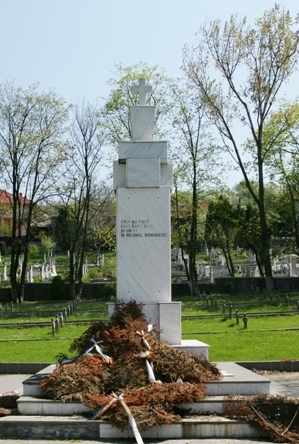 EDIT: The new Monument in Black Marble as of 15th October 2007. 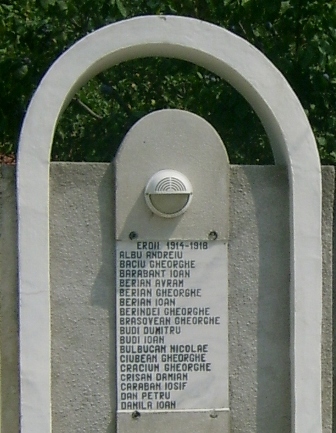 MEMORIAL FOR FALLEN SOLDIERS OF WW1 & WW 2 FROM THE TOWN OF CUGIR, ALBA COUNTY, TRANSYLVANIA, ROMANIA. 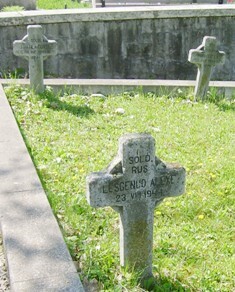 Cugir War Dead 1914 - 1918 Austro-Hungarian Army. 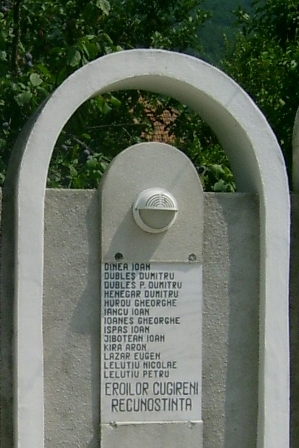 The following list of names is to be found on the War Memorial located in the Transylvanian town of Cugir in the Alba County of Romania. The panel of names for WW1 are for men who served in the Austro-Hungarian Army as in WW1 Transylvania had been annexed by the Austro-Hungarian Empire. This also explains why the war memorial is dated 1914-1918; Romania officially entered the war in 1916. Tablet 1 - 2 - 3 - 4 lists the names for WW1. Tablets 5 - 6 list the names from WW2 as no dates of death are included its hard to tell who died fighting against the Russians and later in the war who died fighting with the Russians. I think the reason for so many men listed as Sergeant in the WW2 section, may stem from the Romanian tradition of promoting a dead soldier one grade higher, hence a Private becomes a Corporal, a Corporal a Sergeant, how that effects a Sergeant rank I am not sure and must inquire, anyway it seems impossible for no Privates (Soldats) or Corporals (Caporal) to have been killed? ?